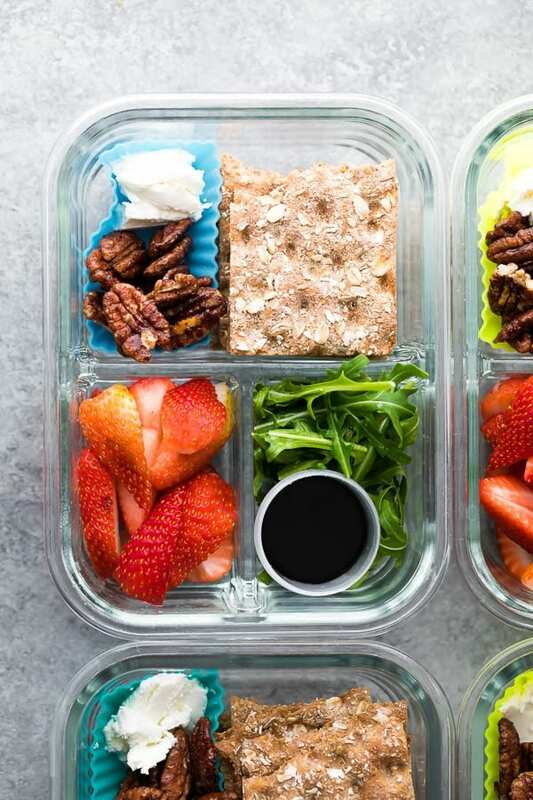 Spring strawberry bento lunch boxes are easy to whip up in under 15 minutes! With fresh strawberries, maple cinnamon pecans, balsamic reduction and more. After polling my Facebook page to see if there was any interest in some no-cook adult lunch boxes, the response was an overwhelming YES!! 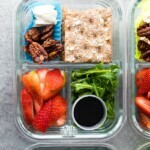 I totally get the interest: lunch boxes = so much faster to prep…in fact these spring strawberry bento lunch boxes are ready in under 15 minutes. Not only that, but this one is served cold, so if you don’t have access to a microwave, it’s just perfect. 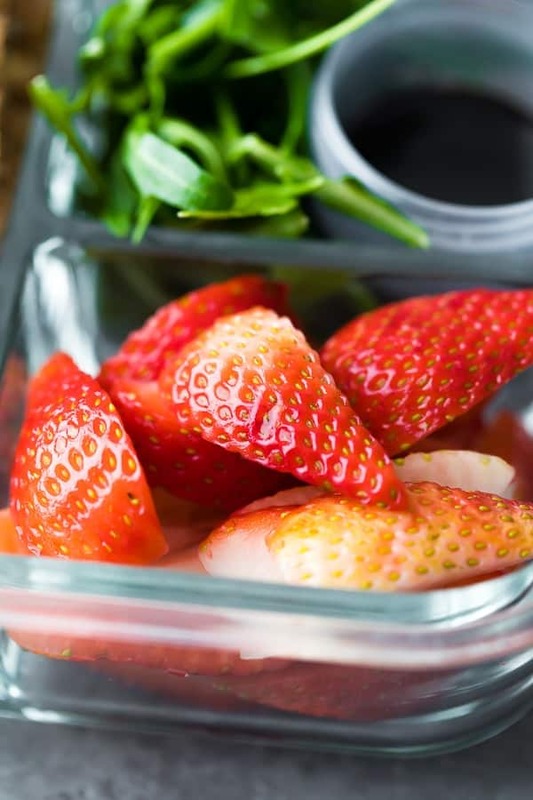 For our first bento lunch box recipe, I had to go with spring flavors….strawberries and arugula…because spring is just around the corner and I am not so patiently waiting! I always thought lunch box/bento box recipes were kind of ‘non-recipes’, and they really are more of an idea of how you can assemble some lunch boxes. You can totally go nuts with these and swap ingredients out to make them suit your diet and taste preferences. 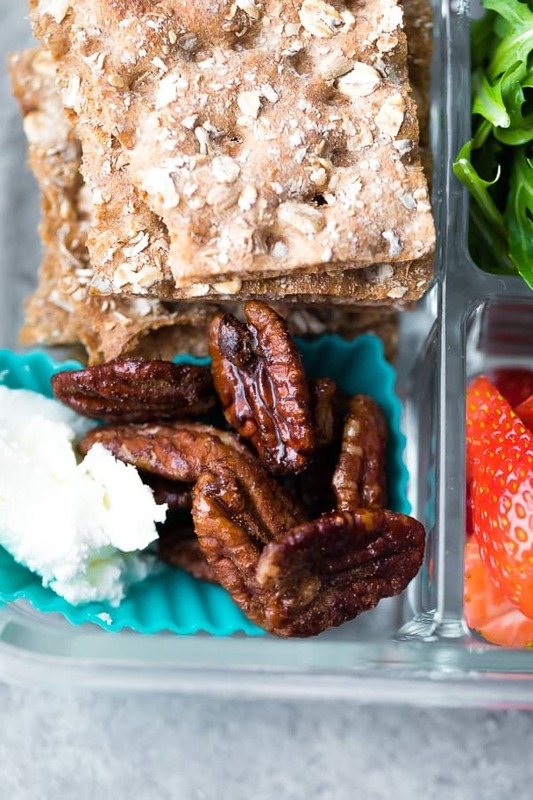 Swap the pecans for almonds, the goat cheese for cream cheese, add in some chicken for extra protein, swap the flatbread crackers for a wrap or even pasta! That’s literally it…so simple and everything is ready in under 15 minutes. 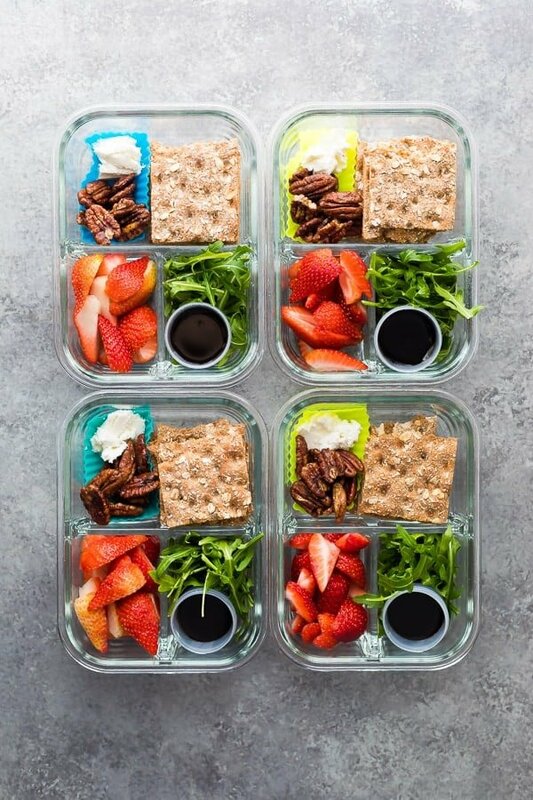 Arrange strawberries, arugula and flatbread crackers in compartments in your lunch containers. Use small condiment containers for the goat cheese and balsamic reduction. For maple cinnamon pecans: toast pecans in a frying pan for 5-7 minutes, until lightly toasted. Add the cinnamon and toss; then add the maple syrup and stir everything up to coat. Allow to cool before adding to the lunch boxes. It’s a fact of life busy school kids need healthy and nutritious packed lunches. Kids love variety and special treats in their lunchboxes. 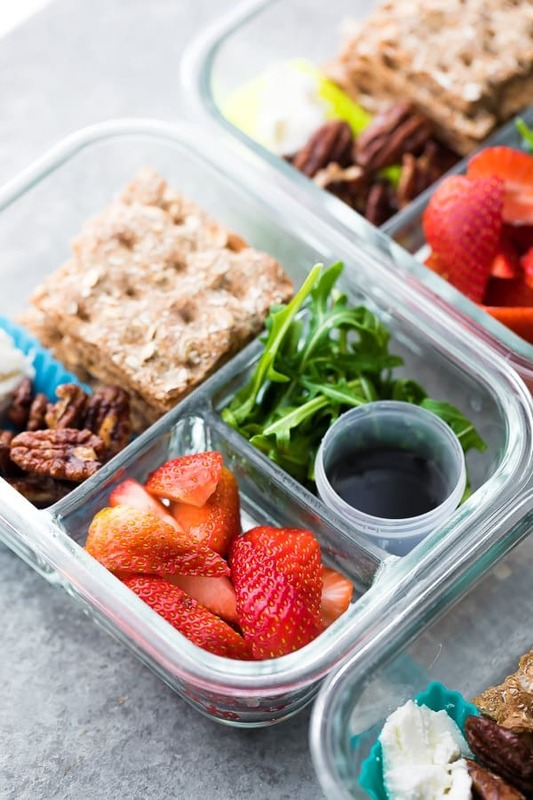 So we have included lots of healthy lunch box options, a great list of sandwich fillings and some yummy and healthy alternatives to the humble sandwich. Such a tasty and fresh snack box! The maple cinnamon pecans are the best part! I made extra to use as a salad topper. Mmmm so good!